We’re excited and honored to say that this recap was written and submitted by the lovely Maggie Stiefvater herself. Because honestly, who could be better at recapping this book?! Especially if you have read this book, you should definitely read this recap, because some of the things written are hilarious. Thank you so much, Maggie, for being so awesome and helping us save the world! Four super fancy private school boys (Gansey, Adam, Ronan, and Noah)(collectively richer than most of us) are searching for a legendary Welsh king (Glendower) in the mountains of Virginia. Blue, the town psychic’s daughter (individually cooler than most of us), reluctantly joins their search after discovering during a ritual that Gansey is supposed to die in the next twelve months. When they find a magical forest that messes with time, things start to go to pot as all kinds of Latin-speaking weirdos and psychic creepers show up hoping for a piece of the magical action. Also, you should probably remember that Blue has no psychic ability of her own, but can make other psychics stronger. Probably also remember that Gansey owns a Camaro. Like the author. Probably this has textual significance. Also, further and also, Glendower was a real Welsh dude who actually did live in the 15th century, so you could Google all that. Really, the take away is that this book is basically educational. Psychics have always told Blue that if she kisses her true love, she’ll kill him. Pshaw, boys. The story begins when Neeve, her half-aunt and a TV psychic, shows up and tells her that this year, she’ll fall in love. Yah, right. Blue and Neeve perform a ritual in a ruined church on something they call the corpse road. They watch for the spirits of folks who are going to die in the next year. Blue is not psychic, but this time, she sees a Real Live spirit. Well, a Real Dead one. She asks his name: “Gansey. That’s all there is.” It’s not the world’s greatest conversation, plus his face is a blur, but still, there are worse ways to spend a St. Mark’s Eve. Flash to not-spirit Gansey. Ronan and Adam must rescue him after the Camaro breaks down. Gansey had spent the night looking for the ley line, a supernatural energy line that he believes in even though he’s really too highly educated to be so gullible. He believes Glendower is buried somewhere along it. He has mysteriously managed to record the lame conversation of the night before. Adam gives Gansey a psychic’s number to try to get another lead. At 300 Fox Way, the house of All-Female Psychic Doings, Neeve scrys in a bowl of grape juice to tell Blue how Gansey is going to die. This vexes Blue’s mother Maura, as she feels scrying is unpredictable and mucking about in the Ether and all that. It doesn’t matter: Neeve only sees Gansey disappear into blackness which Maura says is always near the town. At Monmouth Manufacturing, the All-Boys Super Hipster Old Factory Palace where Gansey lives with Ronan and Noah, Adam arrives with Declan and DeclanGirlfriend. Noah shakes Girlfriend’s hand and says: “SPOILER: I’ve been dead for seven years,” only he doesn’t say “SPOILER.” But the author sure was thinking it as she typed it. Then Ronan basically calls Declan a man-whore and his brother storms out. Flash to Barrington Whelk, the boys’ bitter young Latin teacher, named after a realtor the author met once. He’s shocked to discover Gansey is looking for ley lines. He was also looking for the ley line, once upon a time! Blue is waitressing at the local pizza joint when Gansey, Ronan, and Noah come in. She doesn’t recognize Gansey, as he is alive and has a face. Maura calls Blue to say that “Gansey” has called for a psychic reading the next day. Gansey approaches Blue on Adam’s behalf, pretty much accidentally calls her a prostitute, and that ends the conversation. Adam considers that the ley line might need to be “plugged in” to be easier to detect. Declan shows up and gets into a fist fight with Ronan. Adam sneaks back and gets Blue’s number. Gansey has a late night call with a UK professor friend, Malory, who confirms that the ley line needs to be woken for proper exploration and suggests a ritual. Hanging up, Gansey discovers that Ronan is missing from his room. He is terrified as Ronan tried to kill himself previously. Adam sneaks out of his trailer home to help look; they find him in a church, along with a baby raven Ronan says he pulled from his head. He does not say SPOILER, but the author sure was thinking it as she typed it. We learn that Whelk was also hunting ley lines with a now-dead friend, Czerny. Also that he was an ex-Aglionby student until his father got arrested for tax evasion. There’s a Mustang in this chapter. I wish there could be a Mustang in every chapter. Blue overhears Maura talking to Neeve about Neeve locating Blue’s missing father, who she’s never known. Blue, not Maura. Maura clearly knew him. Because, duh. Blue exists. Adam misses class the day after sneaking out to find Ronan. Also please note on page 113, the name Kavinsky appears. Just saying. Whelk creepily shows up at 300 Fox Way for a reading, creepily admits he is looking for something and then creepily pulls a tarot card Maura associates with Blue. This is so boss-level creepy that Maura throws him out. Gansey discovers Adam got beaten for sneaking out. This pisses Gansey off badly enough that he tries to force Adam to move out, which causes a giant fight. They make up, uneasily. There’s an Old Navy joke in this chapter, too. She doesn’t say SPOILER, but the author was thinking it as she typed it. Gansey pulls the Death card. He asks Maura for help finding the ley line, and she feigns ignorance, even though it’s clearly the same thing as the corpse road. After the boys leave, Maura tells Blue to stay away from them, which always works in YA novels. Ronan wakes Gansey feeding his baby raven, and when Gansey encounters a wasp on his way back to bed, goes crazy to smash it before it can sting Gansey. It’s pretty touching, which is good, because to this point, we all pretty much thought Ronan was a relentless jerkface. Blue catches Neeve scrying into the black space again. Neeve is temporarily possessed by something foul on the ley line. Whelk paws through Gansey’s locker and discovers that Gansey believes that Glendower is sleeping somewhere along the ley line, and that whoever wakes him will get a favor. Whelk’s all, “well, hell yeah, I’ll take a favor.” Except in Latin. Habebo gratiam, dudes. After Adam sends Blue flowers, she decides to help them to try to save Gansey from dying. She accompanies the boys in Gansey’s sister’s helicopter, giving them directions to where she knows the ley line is. Over the mountains, they see a raven cut into the foliage. They land and find a forest where time seems to not work. They also find color-changing fish and a hollow tree that grants visions. Adam’s vision is of Gansey dying because of him. Blue’s is of getting ready to kill Gansey (whom she loves in the vision) with a kiss. Gansey’s vision is of Glendower. On their second trip to the forest, the seasons change as they walk through it. They stumble across a rock inscribed with a Latin joke . . . in Ronan’s handwriting. It also tells them the forest’s name is Cabeswater and that the trees speak Latin. When they speak Latin to the trees, the trees answer. They seem to recognize both Blue and Ronan and direct them to an abandoned Mustang. Noah retches violently. 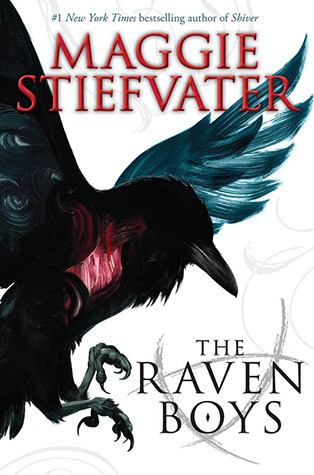 I think Maggie Stiefvater has vomiting in all of her books. I’m referring to myself in third person. When Maura discovers Blue has gone the way of all YA heroines and disobeyed her mother, she scolds her, but relents because Blue was fated to meet the boys anyway. Gansey asks Blue to go back to the ruined church with him to explore, just the two of them. If this sounds romantic to you, remember he’s been wearing Top Siders this whole time. On the walk, he explains why he is looking for Glendower: he is deathly allergic to bee stings, and was stung by hornets seven years before. As he lay dying, he heard a voice tell him that someone else was dying on the ley line when they shouldn’t, and so he would live when he shouldn’t, because of Glendower. They discover a skeleton of an Aglionby boy. It is Noah. Gansey blows back to Monmouth with Adam to confront Noah, who is indeed dead. Noah starts to get more ghostly; Adam thinks this is because the cops have removed his bones from the ley line, which was giving him energy. Ronan gets a notice that he is about to be expelled from Aglionby for bad grades; Gansey bribes his way back in. What a good dad/ friend/ Top-Sider-wearing boy. Noah is barely able to materialize now — he can only do so with Blue’s help. They realize he is the person who died when Gansey lived. Also that he was a failed sacrifice in an earlier attempt to wake the ley line. Whoever wakes the ley line will be granted some kind of favor/ good wish/ strength, similar to the legend of waking Glendower. On the drive back to Monmouth Manufacturing, Gansey’s Camaro breaks down and Whelk confronts him with a gun, demanding his journal full of Glendower information. He admits to killing Noah. They fight and when Gansey disarms him, Whelk squeals off. Blue searches Neeve’s room with Calla and Persephone, two of the other psychics, and discovers that Neeve was originally contacted by Barrington Whelk. Neeve interrupts them in the middle. A group discussion ensues, as Gansey and the boys have also arrived. Accusations fly: Neeve insists she was both looking for the ley line and looking for Blue’s father as requested. She also predicts someone will wake the ley line in the next few days and it might as well be them, to get whatever favor it would grant. No one wants to make an ugly sacrifice for this. Ronan takes Adam home. Adam promptly gets punched by his father, and Ronan intercedes gloriously. There’s a lot of dust and police intervention and Adam finally agrees to press charges against his father. Neeve calls Whelk and arranges to meet. What a couple that would be. Gansey picks up Adam from the hospital; Adam has permanently lost hearing in one ear. He agrees sadly to move in with Gansey, which results in a huge fight, storming off, some loving descriptions of the Camaro’s mechanical foibles, and eventually, some almost-man-tears. Malory calls and reports the ritual to wake up the ley line is unpredictable and he recommends against it. Neeve ties Whelk up; she has decided to sacrifice him to wake up the ley line. But she hasn’t tied him tightly. Adam decides to sneak out of Monmouth Manufacturing and wake up the line himself, before Whelk can get to it. Adam steals the Camaro and heads to the ley line. Invisible ghostfriend Noah wakes Gansey, and they go with Blue to stop Adam. Maura and her friends remain to try to psychically intervene against Neeve. Adam interrupts Whelk and Neeve in the middle of a ritual in Cabeswater — Whelk has gotten free and intends to kill Neeve to wake the line, which Neeve insists will not work, as he is already a killer and therefore cannot sacrifice his innocence again. Gansey and the others show up, Neeve mysteriously vanishes, and Whelk points a gun at Gansey. Adam hurriedly offers himself — his hands and his eyes — as a sacrifice. Bad stuff happens: an earthquake, a herd of horned beasts, a Latin teacher getting trampled. The line is awake and Adam is somehow changed; remote and merciless. Gansey is horrified that Adam didn’t take steps to save Whelk from being trampled. The forest is too unstable for them to remain, so they retreat. Later, after Noah’s funeral, they steal Noah’s bones and return them to the ley line, restoring him to the weird friend he was at the beginning. He doesn’t say SPOILER, but the author was thinking it as she wrote it. I’ve always thought that Maggie was a super cool author, but the fact that she wrote this hilarious and thorough recap for us elevates her “awesome” status off the charts. Thank you, Maggie and Recaptions for saving the world! So Maggie thinks “Spoiler” a lot. Awesome. I wonder if her book queries / proposals look like this when she first plans them. Thanks go to everyone involved in this awesome recap! Much Awesomeness Here in this recap! Thanks Maggie! It was hilarious! THIS IS AWESOME 1) bc OMG MAGGIE! and 2) I was needing a refresher for Dream Thieves and kept putting off the book because of that. Wish I’d read this before I started reading my ARC of The Dream Thieves! Oh well, I figured it out eventually, although not in as humorous of a manner. This is brilliant, hilarious and super informative. I’m off to read The Dream Thieves…. I’m reading the recaps of the first two books in the Raven Cycle so that I can read Blue Lily, Lily Blue. Oh my gosh, this is hilarious! Maggie so totally ROCKS!!! Thanks for this – needed a refresh before picking up the second book – as I had totally forgotten to update my own little recap page with the important details! Not to mention – it is tremendously funny and amazing that the author herself wrote this!